You are currently browsing the tag archive for the ‘Joseph Rosenstock’ tag. Sending happy ninetieth birthday wishes to the legendary pianist Byron Janis! Between 1952 and 1974, Janis appeared with the Chicago Symphony Orchestra on numerous occasions at Orchestra Hall, in Milwaukee, and at the Ravinia Festival, under the batons of music directors Fritz Reiner and Jean Martinon; associate conductors Walter Hendl and Irwin Hoffman; Ravinia Festival music directors Seiji Ozawa and James Levine; and guest conductors Leonard Bernstein, André Cluytens, Igor Markevitch, Dimitri Mitropoulos, Hans Rosbaud, Joseph Rosenstock, William Steinberg, Leopold Stokowski, Willem Van Otterloo, and David Zinman. Janis made his debut with the Orchestra at the Ravinia Festival on July 10, 1952, in Beethoven’s Third Piano Concerto with Dimitri Mitropoulos conducting. He most recently appeared with the CSO in Orchestra Hall on April 20 and 21, 1967, in Prokofiev’s First Piano Concerto and Strauss’s Burleske with Irwin Hoffman conducting, and at the Ravinia Festival on August 15, 1974, in Saint-Saëns’s Fifth Piano Concerto under the baton of David Zinman. 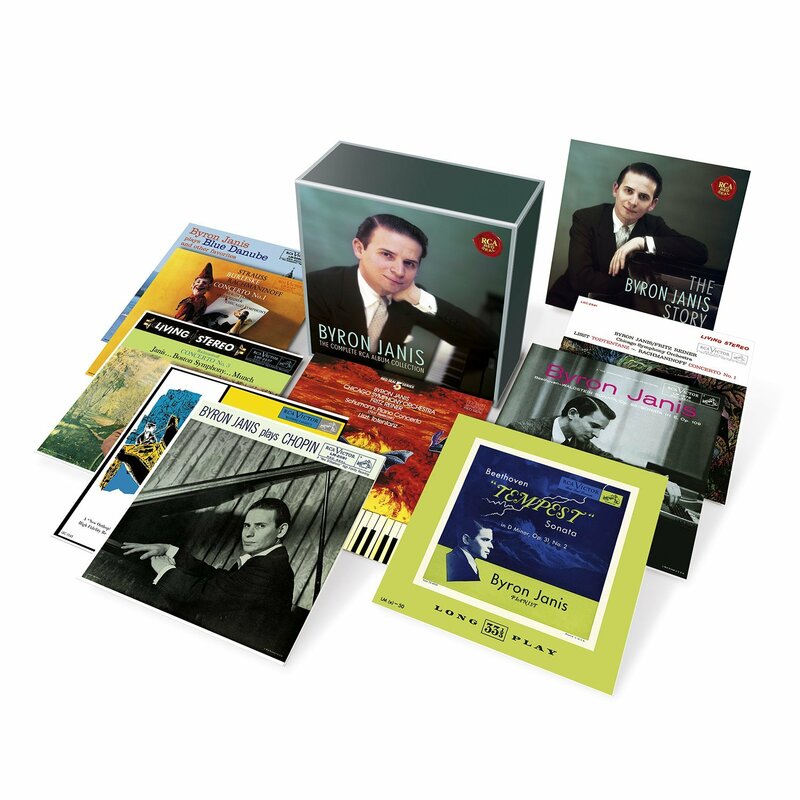 Byron Janis’s complete RCA catalog—including his recordings with the CSO—recently was re-released in a box set. 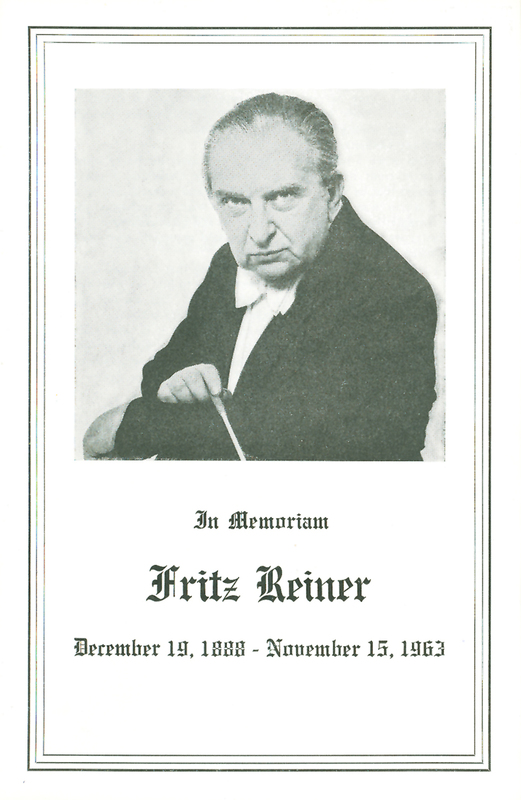 Just before the opening of the Chicago Symphony Orchestra’s seventieth season, our sixth music director Fritz Reiner suffered a heart attack on October 7, 1960. He canceled his remaining appearances for the calendar year to recuperate and was able to return to the CSO podium in March 1961 to lead the season’s final five weeks of concerts. However, his health continued to decline and he was forced to curtail many of his conducting duties, and it was announced on April 20, 1962, that he would become “musical adviser” for the 1962-63 season. 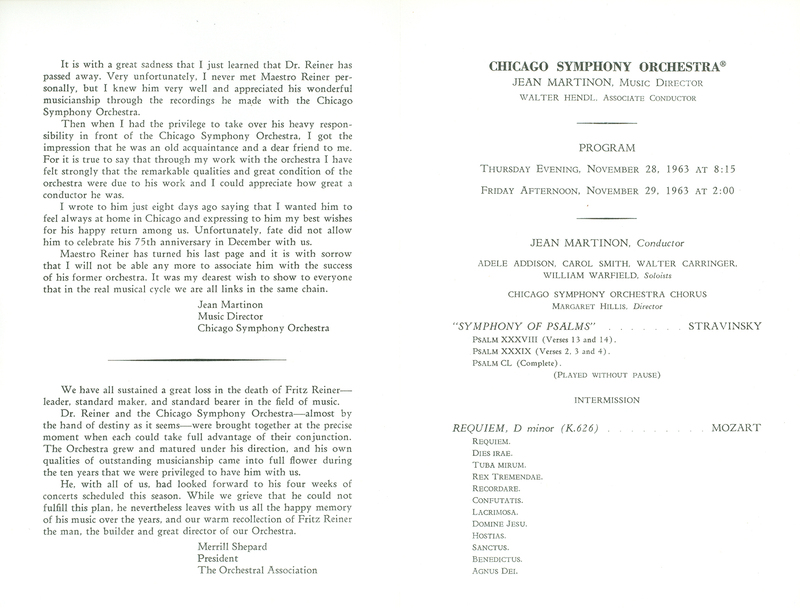 Two weeks later on May 3, The Orchestral Association announced that Jean Martinon would become the Orchestra’s seventh music director beginning with the 1963-64 season. Reiner retreated over the summer and arrived in New York in October to begin rehearsals for a new production of Wagner’s Götterdämmerung at the Metropolitan Opera, scheduled to open on November 14. However, he fell ill with bronchitis on November 11 and withdrew from the production, being replaced by Joseph Rosenstock. Reiner’s condition gradually worsened and he succumbed to pneumonia on November 15, 1963, at the age of 74 (his Chicago Tribune obituary, written by Claudia Cassidy, is here). On Saturday evening, November 16, Martinon led the Orchestra in Mendelssohn’s Fingal’s Cave Overture, his own Second Violin Concerto with Henryk Szerying, and Beethoven’s Seventh Symphony. According to the Sunday, November 17 Chicago Tribune: “Orchestra Hall, filled for a golden decade with the music conducted by Dr. Fritz Reiner, was silent for a minute Saturday night as the audience and musicians bowed heads in tribute to his memory.” Merrill Shepard, the new president of the Association, had signaled the moment of silence. 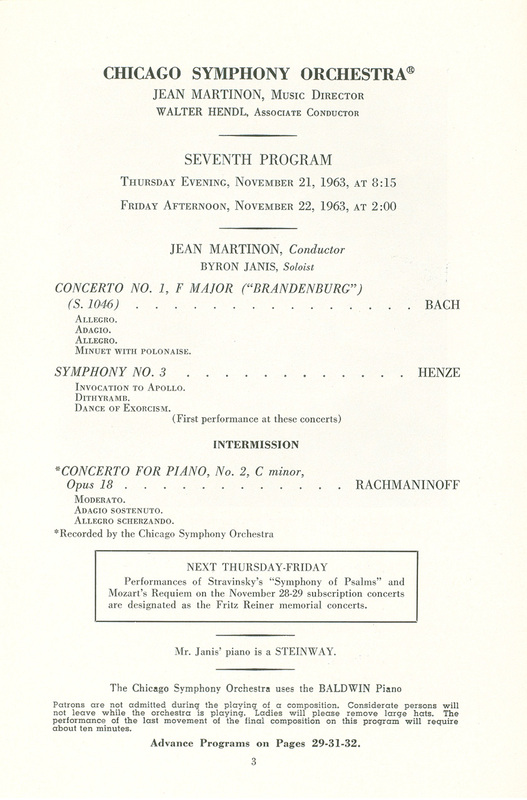 Martinon had programmed the Thanksgiving week concerts (on Thursday evening and Friday afternoon, November 28 and 29) to include Stravinsky’s Symphony of Psalms and Mozart’s Requiem (Margaret Hillis and the Chicago Symphony Chorus had been rehearsing the two works since early September). Reiner’s seventy-fifth birthday—December 19, 1963—was to have been celebrated with him leading the Orchestra in four weeks of subscription concerts in late December and early January. It was only appropriate to designate the Stravinsky and Mozart concerts as memorials to Reiner, and the program page for the November 21 and 22 concerts included an announcement. 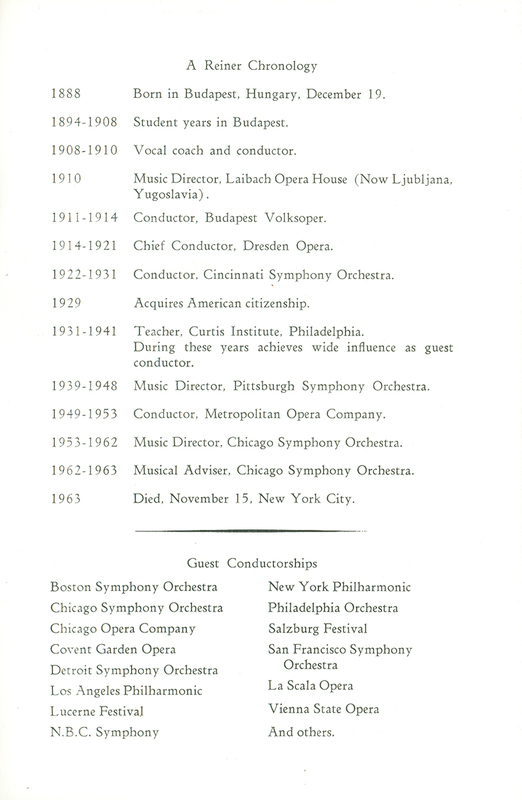 A four-page program insert was prepared to be used for the following week’s concerts and included tributes from Martinon and Shepard, a chronology of Reiner’s career, and a list of his previous orchestral affiliations. On Thursday evening November 21, Martinon led Bach’s First Brandenburg Concerto, Henze’s Third Symphony, and Rachmaninov’s Second Piano Concerto with Byron Janis. The program was scheduled to be repeated the following afternoon, Friday, November 22, 1963. Stay tuned for part 2 . . .